outsourcing – Get Right with Woodson Keeping the tradition vibrant! Why did the innocent @realDonaldTrump throw a two-year tantrum? No better proof of unfitness for office. Those on ASALH’s board who justified taking on the University of Chicago as the publisher of the Journal of African American History knew very little about the publishing business. They claimed that we lacked the capacity to publish even though we had been publishing the JAAH for a hundred years without many in-house services, including a printing press and distribution. Indeed, the sellouts had an obsession with our lack of a printing press. Talking to people who knew as little as they did about publishing, ASALH, and our history of outsourcing publishing tasks, they were persausive to some. The notion that the University of Chicago Press (UCP) has this robust in-house publishing operation whereas ASALH does not would have been scandal if these folks were not as sincere as they were ignorant. There are a number of companies that provide publishing services to publishers–even though they are sometimes publishers themselves. While we have used Tapestry Press, a small company from Massachusetts, many have used Sheridan, a firm out of Pennsylvania and others have used Cenveo. 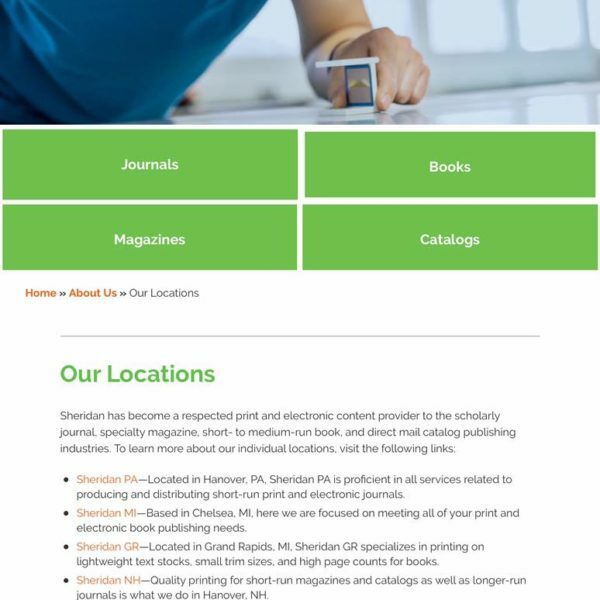 Sheridan’s clients include or have recently included the University of Illinois Press, Penn State University Press, and the University of California Press, and–yes–the University of Chicago. Copy editing at the University of Chicago Press is outsourced, too. Here is a link to a blog by Carol Saller, who wrote a book published by Chicago about how to succeed at freelancing as a copyeditor based on her experience with them at UCP. It is not difficult to hire the same free lancers used by major presses. In fact we at ASALH have done so and continue to do so–just not for the Journal of African American History. 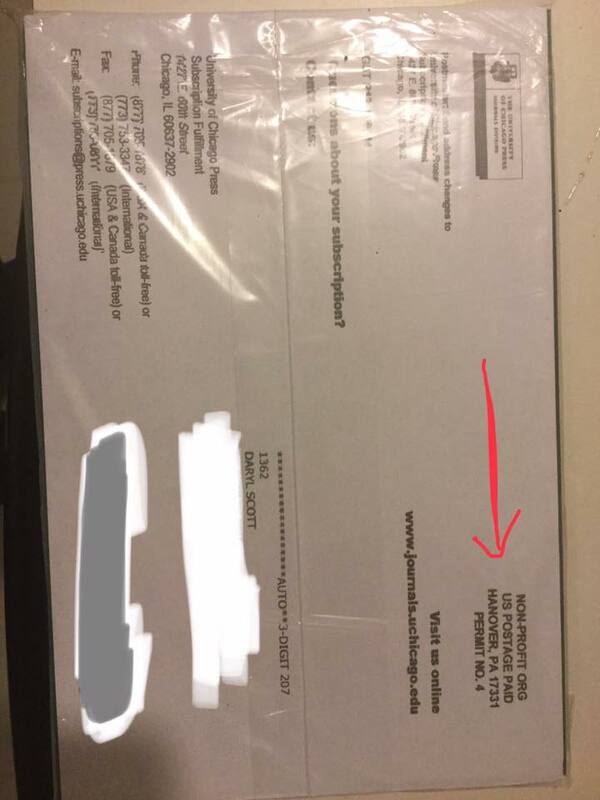 We used the services as part of a package from a vendor, Tapestry. Here is Chicago free lance copy editor, Rachel Karmins. Printing It is very unlikely that the University of Chicago Press prints journals with lots of copies (roughly 300 or more) in-house because it is more expensive. Through its Chicago Distribution Center, the press has short-run printing capabilities. This is probably why the original proposal emphasized digital distribution and left out print as a benefit for ASALH members and charges $20 per member. The agreement calls for Chicago to provide branch and life members copies of the journal, and they come from Sheridan, which is used by many scholarly journals, and, of course, could have been used by ASALH. Here is the mailer from Sheridan with the latest issue of the JAAH, edited by Pero Dagbovie. See, publishers outsource. Digital Services and Hosting While the University of Chicago now has its “own” digital platform that allows it to provide access to digital versions of journals, it actually does not have a platform, per se. It is rather a client of Atypon, which owns the software (Literatum) and the hardware that houses that allows Chicago to host its own and other folks’ journals. This is not in-house. Prior to this year, Chicago used JSTOR–just like we do. In turn, JSTOR, until this year, used Atypon’s services, too. It has invested in its own platform, and JSTOR provides us with the platform and the hosting services for a fee. In a twist of fate, Atypon has been purchased by the major journal publisher, Wiley, which means Chicago is now on a commercial publisher’s platform. Shipping The University of Chicago Press, just like ASALH, does not ship the journals to subscribers from their offices precisely because they are not in-house printers. That would not be cost effective. As in most of the modern world today, the product is often shipped right where is is created. In this case, from the printer. This is why Chicago tells anyone who wants a hard copy of an article or a journal to contact their printing house, Sheridan. Reprints of Journal and articles There is not much money in reprints of articles as there used to be. Rather than sell individuals individual articles as reprints, ASALH keeps a number of journals on hand and sells whole issues and makes sales this way that goes as revenue from the “ASALH Store” not the journal. Now this minor stream of revenue, probably a few hundred dollars a year, is not worth Chicago’s time. At times, however, members might buy a dozen or two dozen copies of their issue or a special issue. One year, a customer wanted 400 copies of the Hip Hop Special issue. I have printing and bind capabilities, so I did the project and ASALH made $8,000 as I swallowed the time and materials cost. Go to Chicago and they would control this. But they outsource this too to Sheridan. Here Sheridan provides folks a page on their site to order reprints of Chicago journals. For complete back issues, they outsource that function to the Periodical Services Company and Schmidt Periodicals Gmbh.